Choosing to stay in your house while watching a movie with your family not only creates closure but also saves all the expenses. This is how 2000 IHT Sound bars can provide enjoyment and in how they satisfy your sound system clarity issues. Want an alternative sound system for your TV instead of big stereos? Buy Polk Audio’s 32-inch Sound Bar that will give you a home theater experience! Sound bars work, simply put, when they imitate sounds. They simplify the entire course by replicating the exact surround sound using a single amplified speaker technology. In an article published online, Carmelo Arena, the Director of Sound and Image once said that the technology confuses your senses and that it is tricking them so they’d believe that the sound is coming from behind you even when it is not. This is how sound bars surprisingly creates an illusion every time they replicate sounds. They are not only made simply to reproduce whatever kind of sound is on the television, but they actually improve the quality aside from its obvious usage in making the sound even louder. Evidently, sound bars provide high-quality sound that could transform your simple rooms into a home theater experience. While most of us are already contented with the built-in speakers on our flat screen television, having sound bars will definitely give you an experience you never had before when listening to different genres of music and watching movies. Polk Audio offers its’ 2000 IHT Sound bar with practical features intended for specific uses. Know the reason why 2000 IHT Sound bars became easily demanded by the customers. Polk Audio 2000 IHT Sound bar is perfect for flat panel TV installations. It has a shallow-depth design and imitates a clear surround sound which makes the blending almost seamless. Polk’s Sound bar size is so compact that you can position it anywhere you want, be it on the ceiling, wall, shelf, and cabinet or in any parts of your preferred room. It was uniquely engineered providing the best multiple-driver arrays both for vocal clarity and realistic imaging. 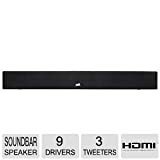 This sound bar can be easily connected directly to your television, DVD, gaming consoles and other appliances for convenience and for better sound system experience. This sound bar has a measurement of 2.25-inch deep for easy transfers. It comes with a Dynamic Balance technology that allowed the engineers to remove the driver that causes distortions and system resonances during the transfer. Ever since Polk Audio released the 2000 IHT Sound bars, the customers’ reviews have also been increasing through the years because of the good sound quality it truly possesses. Carmelo mentioned in an interview, that having their sound bars, one no longer needs reflecting walls, rear speakers, sub-woofer or an AV receiver to achieve a high quality experience. To elaborate on this, sound bars are primarily designed to bounce sound off the wall to give you the most desirable surround sound effect. Mostly, customers who give feedbacks say that 2000 IHT Sound bars are so easy to install and are also highly regarded because of their compact size, great stereo separations and high sound clarity. One customer has even commented that 2000 IHT Sound bars are the greatest legacy of Polk Audio! Customers who presented negative feedback were not mostly on the technical side of the sound bars. The most often comment is that the LED on top of 2000 IHT is so small that it would not be visible if it were mounted high on a wall. Despite the simple size and structure of Polk Audio 2000 IHT Sound bars, what matters is that they bring every boring and cliché rooms into life by providing the best sound system effects. It is highly recommended for families who always or often move from different houses to have 2000 IHT Sound bars. Not only that they get to save space for big stereos, but also for their convenience. These sound bars are so compact that it will not be difficult for them to reinstall. Start leveling up your flat screen television speakers from built-in to sound bars! Polk Audio 2000 IHT Sound bars are absolutely worth your money. They are built to perform for a lifetime. Everyone should technically buy Polk Audio 2000 IHT Sound bars! Not just it provides a mini home theater experience whenever one gets to watch a movie, but they go beyond anything your television or even the radio could provide you. What others don’t realize is that they actually save money. This allows more time spent with their loved ones without knowing it.